Chinese residents were left terrified after mistaking a pink-skinned stray dog for either an escaped genetically modified pig or a strangely coloured mini-horse. The bizarre breed of dog was spotted roaming around the streets Xinxiang in the Henan province, central China, sparking fears it has escaped from a nearby medical research centre. 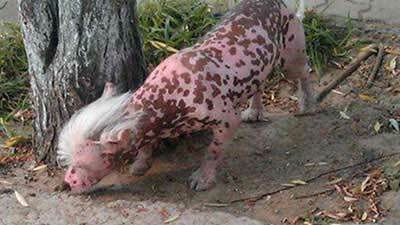 With its strange-coloured skin and hairless body, many observers speculated the rare breed could have been some sort of strange mutant pig. However police have denied the animal is the subject of a genetic experiment - confirming it is actually a breed known as a Chinese crested hairless dog. 'It is definitely a dog, and quite an expensive one at that,' said a spokesman.